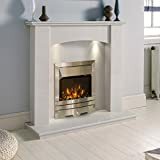 Electric White Surround Black Silver Steel LED Flame Fire Wall Free Standing Fireplace Suite Large 54"
Stylish Electric Fireplace Suite. Made to order in the UK by skilled craftsmen. Buy with confidence - We can be trusted! 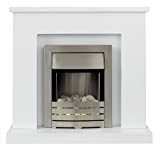 These are not mass produced fireplaces and therefore you are guaranteed a quality product at a great price! The mantel is made from timber and then sprayed to a smooth brilliant white colour, hearth & back panel made from timber & painted matte black. Brushed stainless steel fire comes with BOTH pebbles & coals and has 3 Settings: Effect only, 1kw, 2kw. LED bulbs and bright moving flame effect! 1 Year guarantee with fire. This fireplace arrives part assembled and requires minimal assembly. Approximate Dimensions: Height: 46", Width: 54", Depth: 15". Do you have a flat wall?... 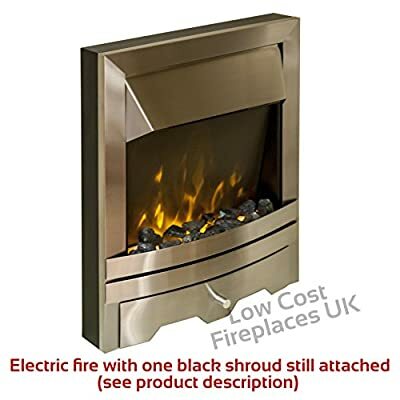 Your silver electric fire will arrive with two black shrouds attached to the back of it as standard. If your full fireplace is to go against a flat wall, then you simply unscrew one of the shrouds (1 minute job) and leave the other shroud attached. 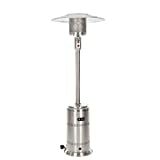 This will allow your fireplace to go against a flat wall (Please see product images for an example image of what your silver fire will look like with one shroud still attached). Please note that colours shown in the product images should be treated as a guide only. Delivery Schedule: Once you place the order you will then be contacted and informed of a specific delivery date(s). If required you can return this item in line with Amazons returns policy. The item would need to be returned to us the original condition/packaging. You would need to pay any courier costs incurred. 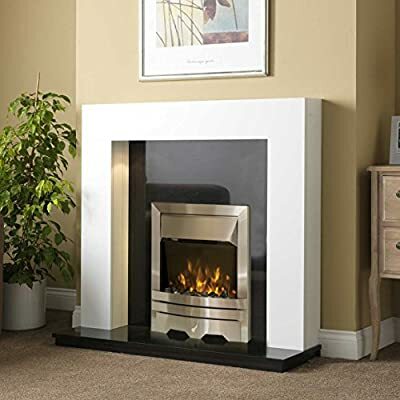 Brilliant White Surround, Black Timber Hearth & Back Panel with Electric Brushed Steel Fire UK Mainland Only (we do not deliver to IV, KW or TR postcodes) When ordering, Please send us a contact phone number Please see full description (below) Low Cost Fireplaces is a trusted online retailer with over 10 years internet experience. 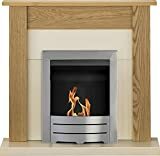 Most of our fireplaces are made to order in the UK by skilled craftsmen who use high quality materials. Our business has gone from strength to strength in recent years due to our ongoing commitment to high quality products at low prices.